Falling in Love with Hominids presents more than a dozen years of Hopkinson’s new, uncollected fiction, much of which has been unavailable in print, including one original story. Her singular, vivid tales, which mix the modern with Afro-Carribean folklore, are occupied by creatures unpredictable and strange: chickens that breathe fire, adults who eat children, and spirits that haunt shopping malls. I typically read short fiction for one of two reasons, either it’s an author whom I love, and I’ve devoured everything else of theirs so I dig into their short-form stuff, or it’s an author whom I’ve never read before and I want to sample their work without trying to pick out a full-length book to start with. The latter was the case with Nalo Hopkinson’s Falling in Love with Hominids. Hopkinson is an author who’s been on my radar for a while now, so when the opportunity came along to check out her yet-to-be-released short fiction collection I jumped at the chance. The collection starts out with a story set in a post-apocalyptic world where humans turn into angry flesh eating plants when they reach adulthood. For my money, this was the perfect story to kick off the collection. It is an incredibly gripping tale and introduces two over-arching themes that seemed to be prevalent throughout; humans and plants. Okay, so that first theme sounds pretty obvious, most stories are usually about people, but remember, the title of this collection is Falling in Love with Hominids and story after story Hopkinson really makes you love the humans who populate her stories… even when they are ghosts. I was quite impressed with Hopkinson’s ability to create such interesting and engaging characters in the short space allowed in a short story format. Another quality I loved was that Hopkinson populates all her stories with what is possibly the most diverse cast of characters I’ve come across in the fantasy genre. Like most times when I read short fiction collections, there were a few stories in Falling in Love with Hominids that I enjoyed less than others, but overall this was a very good collection, and probably the most unique short fiction collection I’ve had the pleasure of reading. Even after having had a few days to reflect upon the stories, I still can’t pick a favorite, but a number of them stand out very strongly in my memory. Falling in Love with Hominids was one of those rare books that grabbed my attention and refused to let me do things like take notes or jot down tidbits I wanted to write in my review. This is a book that reeled me in for all the right reasons and made it nearly impossible to take my eyes off the page. Every reader will surely find something to love, as this collection is often hilariously funny, deeply tragic, intensely engaging, and strongly steeped with fantastic elements. Any author who can connect chickens to dragons via a genetic family tree is obviously doing something special with their writing. It is refreshing to read an author who appears to not give a damn about genre conventions, boundaries or norms. Instead, Hopkinson provides one vivid, gripping story after another and presents a collection that demands to be noticed as a work that ignores the typical standards we see in speculative fiction all while expanding the boundaries of the genre. Falling in Love with Hominids isn’t so much groundbreaking as it is genre-molding, and Hopkinson is showing anyone who’s looking how truly unique, interesting and engaging science fiction and fantasy can and should be. 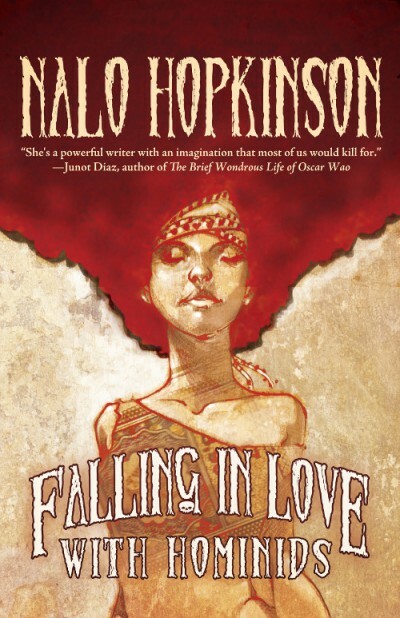 Nalo Hopkinson‘s Falling In Love With Hominids is published by Tachyon Publications in August 2015. I’ve only read one Hopinkson book so far (Brown Girl in the Ring), but I will definitely have to check this out. The title was intriguing, and it sounds like it would be a great sampling of her writing, character, and world exploring.